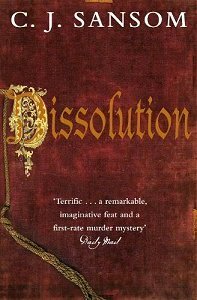 I am currently reading Dissolution (2003) a historical mystery novel by British author C. J. Sansom. It was Sansom’s first published novel, and the first in the Matthew Shardlake series and was olso dramatised by BBC Radio 4.IT is Set in the 16th century during the dissolution of the monasteries, Henry VIII has severed links with The Pope and proclaimed himself Supreme Head of the Church of England and now the country is waking up to savage new laws, rigged trials and the greatest network of informers ever seen. Under the order of Thomas Cromwell, a team of commissioners is sent through the country to investigate the monasteries. There can only be one outcome: the monasteries are to be dissolved. But on the Sussex coast, at the monastery of Scarnsea, events have spiralled out of control. one of Thomas Cromwell’s Commissioner Robin Singleton, has been found dead, his head severed from his body. His horrific murder is accompanied by equally sinister acts of sacrilege – a black cockerel sacrificed on the alter, and the disappearance of Scarnsea’s Great Relic. Dr Matthew Shardlake, lawyer and long-time supporter of Reform, has been sent by Cromwell into this atmosphere of treachery and death to attempt to solve the murder But Shardlake’s investigation soon forces him to question everything he hears, and everything that he intrinsically believes . .
Cyber Monday is the Monday after Thanksgiving in the United States. The term “Cyber Monday” Was first used within the ecommerce community during the 2005 holiday season amd was created by marketing companies to persuade people to shop online. The term made its debut on November 28, 2005 in a Shop.org press release entitled “‘Cyber Monday Quickly Becoming One of the Biggest Online Shopping Days of the Year”.Get latest deals on Cyber Monday 2013 from hereAccording to Research “77 percent of online retailers said that their sales increased substantially on the Monday after Thanksgiving, a trend that is driving serious online discounts and promotions on Cyber Monday this year. In 2010, comScore reported that consumers spent $1.028 Billion online on Cyber Monday , the highest spending day of 2010.Cyber Monday has become an international marketing term used by online retailers inCanada, the United Kingdom, Portugal, Germany, Chile, Colombia, Ireland, Japan, andChina. In 2009, comScore reported that online spending increased 5 percent on Cyber Monday to $887 million and that more than half of dollars spent online at US Web sites originated from work computers (52.7 percent), representing a gain of 2.3 percentage points from last year.Buying from home comprised the majority of the remaining share (41.6 percent) while buying from international locations accounted for 5.8 percent. According to comScore chairman Gian Fulgoni, “comScore data have shown that Cyber Monday online sales have always been driven by considerable buying activity from work locations. That pattern hasn’t changed. After returning from the long Thanksgiving weekend with a lot of holiday shopping still ahead of them, many consumers tend to continue their holiday shopping from work. Whether to take advantage of the extensive Cyber Monday deals offered by retailers or to buy gifts away from the prying eyes of family members, this day has become an annual ritual for America’s online holiday shoppersWebsite visits on Cyber Monday will break all previous online records, it has revealed. On a single day, there will be 113m visits to e-commerce sites.“With just four weeks until Christmas, most of us will just have been paid, so Cyber Monday is the day when consumers rush online to do their Christmas shopping,” explained Simon Black, CEO at Sage Pay.Cyber Monday is traditionally the day that Brits adopt a “spend now, think later” attitude to shopping. l think It is rather sad how the secular business world has turned the birth of Jesus into a money making racket and greedy Companies see it as an opportunity to get people to buy imported tat they don’t need with money they don’t have Whilst the Companies get rich. l am not trying to Sound like Ebeneezer scrooge. I understand that it is to do with the three wise Men bearing gifts , but the real message of Christmas seems to have got lost amongst all the commercialism. l also dislike large corporations that avoid tax but who can blame them, they’re working within rules. The UK tax man allows this to go on whilst screwing individuals and smaller businesses with gusto, bankrupting ordinary hard working people that may have suffered bad luck not just with impunity but almost delight.It’s all just part of the system . .In 2000, the band recruited Queen guitarist Brian May to add some guitar flourish to a cover of Pink Floyd’s “Have a Cigar”. The friendship between the two bands resulted in Grohl and Taylor Hawkins being asked to induct Queen into the Rock and Roll Hall of Fame in 2001. Grohl and Hawkins joined May and Queen drummer Roger Taylor to perform “Tie Your Mother Down”, with Grohl standing in on vocals for Freddie Mercury. (May later contributed guitar work for the song “Tired of You” on the ensuing Foo Fighters album, as well as on an unreleased Foo Fighters song called “Knucklehead”. )Near the end of 2001, Foo Fighters returned to the studio to work on their fourth album “One by One”. After which, Grohl accepted an invitation to join Queens of the Stone Age and helped them to record their 2002 album Songs for the Deaf. On November 23, 2002, Grohl achieved a historical milestone by replacing himself on the top of the Billboard Modern Rock chart, when “You Know You’re Right” by Nirvana was replaced by “All My Life” by Foo Fighters. When “All My Life” ended its run, after a one week respite, “No One Knows” by Queens of the Stone Age took the number one spot. Between October 26, 2002 and March 1, 2003 Grohl was in the number one spot on the Modern Rock charts for 17 of 18 successive weeks, as a member of three different groups.On June 14, 2005 Foo Fighters released their fifth album In Your Honor Featuring collaborations with John Paul Jones of Led Zeppelin, Josh Homme of Queens of the Stone Age and Norah Jones. the album was a departure from previous efforts, and included one rock and one acoustic disc. Foo Fighters’s sixth studio album Echoes, Silence, Patience & Grace was released on September 25, 2007. and spawned three singles “The Pretender”, “Long Road to Ruin” and “Let It Die”. On November 3, 2009 Foo Fighters released their first Greatest Hits collection, consisting of 16 tracks including a previously unreleased acoustic version of “Everlong” and two new tracks “Wheels” and “Word Forward” which were produced by Nevermind’s producer Butch Vig. The Foo Fighters’ latest studio album, Wasting Light, was released on April 12, 2011, and contains the single “Walk” among other great songs. Rick Savage, bass player with Def Leppard was Born 2nd December 1960.Formed in 1977 in Sheffield as part of the New Wave of British Heavy Metal movement.Def Leppard ’s strongest commercial success came between the early 1980s and the early 1990s. Their 1981 album High ‘n’ Dry was produced byRobert John “Mutt” Lange, who helped them begin to define their style, and the album’s stand out track “Bringin’ On the Heartbreak” became one of the first metal videos played on MTV in 1982. The band’s next studio album Pyromania in 1983, with the singles Photograph and Rock of Ages, turned Def Leppard into a household name. In 2004, the album ranked number 384 on Rolling Stone’s 500 Greatest Albums of All Time. Def Leppard’s fourth album Hysteria, released in 1987, topped the U.S a nd UK album charts. As of 2009 it has 12x platinum sales in the United States, and has gone on to sell over 20 million copies worldwide. The album contained loads of great songs, including the U.S. Billboard Hot 100number one “Love Bites”, alongside Pour Some Sugar on Me , “Hysteria”,Armaggeddon It , “Animal” Rocket“., Gods of War and WomenTheir next studio album Adrenalize reached number one on the U.S. Billboard 200 and UK Album Chart in 1992, and contained several hits including, “Let’s Get Rocked” and “Have You Ever Needed Someone So Bad”. Their 1993 album Retro Active contained the acoustic hit song “Two Steps Behind”, while their greatest hits album Vault released in 1995 featured track “When Love & Hate Collide. The horrors of slavery have been brought home recently.by the plight of three, women Who allegedly lived in the fearful, dark shadows.and were, according to police, the victims of terrible psychological and physical abuse; effectively kept as slaves and held against their will as members of an extremist, political cult led by Aravindan Balakrishnan – a disciple of Chairman Mao, the late Chinese communist leader, and known as Comrade Bala to his devotees – Who ran a community so secret that nobody realised that three women, apparently free to come and go at will, were apparently shackled in all that time to their mercurial leader by “invisible handcuffs”.Josephine Herivel, now aged 57, was one of those women. She was a brilliant young violinist, whose eminent father had been instrumental in breaking the Nazi’s Enigma wartime code at Bletchley Park.But Miss Herivel became cut off from her family in the mid-1970s some time after arriving in London from her native Belfast, where her father was a lecturer at Queen’s University. By the time he died, two years ago, she had been left out of the family will while his obituaries made mention of just two daughters, not three.